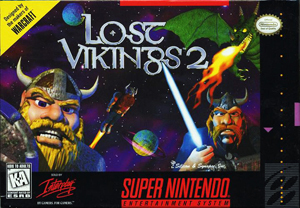 Lost Vikings 2: Norse by Norsewest for Super Nintendo has the lost boys back again. Now, armed with all new high-tech weaponry the boys heisted from Tomator, they set out to find the time machine that will land them back home. It's your challenge to complete each of the levels with all three characters alive an kicking. For 1-2 players. 32 Levels.